I really debated whether or not to dabble in the PGA Tour’s fall series. However, I decided that since a) the Turning Stone Championship is, by my count, the only PGA Event held on an Indian Reservation/Casino and B)it is the closest PGA event to Rexford, NY, I would take a shot. All picks came from the pgatour.com “expert picks” and “sleeper picks” because ESPN either does not care about this tournament or haven’t put them up yet. I don’t have time to wait for them because I’m not putting this post up on the first day of the MLB playoffs. *Normally I never take someone that these guys picked, but I may make an exception in this case because Win McMurray? and T.J Auclair? both picked him as a sleeper. Nice sleeper guys, He’s only the top line favorite at 16-1 this week, and has the best scoring average in the field. Some would call him a favorite. Kevin Na: Perfectly inconsistant in his last few starts, alternating decent showings and missed cuts. I like the fact that he finished 8th at the Canadian Open on what I think will be a similiar set up. Overally play this year is pretty good, with 3 top tens. Tommy Armour III: Made it to the BMW Championship this year and was worth a look , but that was all. Briny Baird: leads the tour in GIR’s and is always very enticing at his price range. T-21 and T-11 at Duetsche Bank and Canadian Open on similiar style modern courses. Tom Pernice Jr.: Played very well earlier in the season, but has missed 2 cuts in his last 4 events. I just wasn’t willing to make the leap with Pernice. Jeff Quinney: Had a great start to the season, and I like his game okay but I feel like he may have played over his head for a while this season. Seems to be slowing down. Nick Watney: If Nick Watney improves his short game and putting he will win a tournament. As it stands I’m not taking a chance on him. Nick O’Hern: Not quite a good enough ball striker for this course. Great short game though. Steve Elkington: Last man out. Steve has had a very under-rated season (3 top tens, 7 top 25s), but I just don’t think he can get over the hump and into the money this week. Robert Allenby +1600 (2.5): Very small play, but I can’t pass up this chance to take a man who has made 24 straight cuts, with 7 top 10s this year. I hate taking all this chalk, but he is far and away the best player in this field and has been under-rated all season long. Steve Marino +4000 (5): Love his game. Played well at Canadian Open earlier this year earning a top-5 finish. Great ball striker, who I hope can putt well enough to get the win this week. John Merrick +5000(5), John Merrick top-5(2.5):Another good ball striker, and a slightly better than average putter. John Senden +1000(2.5): It came down to Elkington and Senden for this last Top-5, The difference was i just didn’t want to take another chance on Elkington this year. Lets hope they have the Shot-tracker up and running for this AAA event. Pat’s back must be sore from carrying the team all season…er, um, nope, it just hurts. Yeah, so I don’t really care too much about this game since neither team is going to make it to the world series. I do however feel obliged to watch at least part of it, and even more so to bet on it. Therefore, I am taking the Twins +133. Blackburn vs. Danks…lets see…Danks, just not good. He’s had a pretty good year but he is overrated right now. Awful last few starts. Blackburn, slightly more than a mediocre pitcher. Did i mention that Danks is pitching on three days rest? No thanks, Twins should have this by the 4th. Danks, much like Floyd of yesterday is not Sabathia. Floyd pitched better than i expected but he’s also a better pitcher than Danks. Also, the Twins have something to play for while the Tigers had to cancel their tee times. Playoff baseball is just a day away, until then, try to enjoy this “playoff” game. Or just watch House. P.S. Should i tell my teacher that its pronounced Obama, not Obamer? Tough one. Houston +3 vs. Indianapolis: Indy has been very very mediocre this season. I don’t like their chances to turn it around at all. The only caution here would be that people do not seem to be as high on Indy as they usually are. Miami +7 vs. San Diego: I’m not very keen on this one, but It could be a possibility because Miami is going against an awful Charger defense and Norv Turner. Carolina -10 vs. Kansas City: That is a big number to lay and I doubt i will in the end, but there may be some value in this line if people overrate KC’s blowout win against an overrated denver team. Tampa Bay +3.5 @ Denver: Denver’s defense is terrible. I’ve documented that in previous posts. If the public is willing to jump on Denver at this number, I’m certainly willing to take Tampa Bay. Arizona PK vs. Buffalo: What? Arizona lost last week huge to the Jets and they are only a pick’em against the Bills. The 4-0 Bills. Something seems a little strange there. Minnesota +3.5 @ New Orleans: New Orleans is overrated. Case in point: Minnesota was getting 3.5 on the road from Tennessee last week. I really doubt Tennessee and New Orleans are equal teams. Baltimore +3 vs. Tennessee: Baltimore looked okay on Monday Night Football last night, but they probably should have won that game. I may shy away here because of that. However, I did hear 3 ESPN NFL analysts say that Tennessee was the best team in the AFC. MATT: Pats win by no fewer by than 20 points. KEVIN: Six or more top 25 teams will lose this week. K-Rod will blow a save in the first round. JEFF: Red Sox will lose the first round. It was a weird year for the Phils. They gave up Rowand and failed to get a starting pitcher in the offseason. The Mets got Santana. But, It was the Phils who dominated early on. Then inter-league play hit. All of a sudden a team that scored 20+ runs twice this season, couldn’t score. Somehow they managed to bring it all together in September just like last year. In the end, They closed out the season on 13-3 run starting with the September sweep of Milwaukee. Somehow, Ryan Howard found his bat, Jimmy Rollins picked up his play, Chase found his swing, Myers found the strike zone and as always Lidge was there to close it out. To single those players out would be unfair to Jayson Werth, Shane Victorino, Cole Hamels, and the bullpen that were solid for the Phillies all year. Come Wednesday, It is a second shot for this team, where they failed last year. At home against the wild card with King Cole on the hill. A position by position look at this series. CARLOS RUIZ/ CHRIS COSTE: Ruiz is known to all Phillies fans for his perfection of the technique of grounding into a double play. Coste is a great story and a very likeable guy but really has not been as effective with the bat as he was last year. Their respective .320/.325 on base percentages and combined .239 batting averages are not scaring anyone at the plate. JASON KENDALL: Was once one of the better hitting catchers in the major leagues. Not anymore. 2 homers and 49 RBIs on the year for Kendall. Hit .246 with .327 on base percentage. RYAN HOWARD: What can you say about Ryan Howard. After strugglingggggggg to start the season, he ended up with a respectable .251 average, 48 homers and 146 RBI. His September performance (.352/11/32 to go along with a .422 OBP and .852 slugging%) vaulted him into the NL MVP discussion. Defense is a bit shaky, to say the least. PRINCE FIELDER: One of the best first baseman in the NL, Fielder knocked 34 homers and drove in 102 runs this year. He had a huge walkoff homer against the Pirates in the final week of the season. CHASE UTLEY: Best OBP(.380) on the team, 33 homers, 104 runs driven in, and a slugging percentage over .500. Basically he gives you the same production as Prince Fielder at the plate—and plays second base. His power production has trailed off significantly after having 18 homers at the end of May, he has only 14 since. RICKIE WEEKS/RAY DURHAM: Chase Utley. ‘Nuff said. JIMMY ROLLINS: Last year’s MVP was not able to repeat his performance of last year. Of course he was about 15 homers above his career average, and batted about 20 points higher. His .277 average and 11 homers were more in line with his career averages. Rollins did post a career high .349 OBP, solid defense and 47-3 SB/CS ratio defintely helped the Phils make the playoffs this year. PEDRO FELIZ/GREG DOBBS/ERIC BRUNTLETT: These guys have combined to do a solid job for the Phils off the bench. It seemed like Feliz had a few key hits for the Phillies down the stretch, but in the end the Phillies are not looking for too much production from this spot. CRAIG COUNSELL/BILL HALL: Counsell’s .355 OBP is slightly higher, but he doesn’t give you too much power. Hall hit 15 homers but a sub-.300 OBP is not very good at all. THE ARTIST FORMERLY KNOWN AS “PAT BURRELLS CONTRACT YEAR.”: Burrell hit .275/23/57 before the All-Star break with a .404 OBP, when he was known as “PB’s Contract Year.” Since changing his name during the break, He has hit .215/10/29 with a .313 OBP. At this point his only hope is a lefty. RYAN BRAUN: Arguably the Brewers best hitter this season. His batting avg., OBP, slugging, HRs and RBIs are all better than Fielder this year. I’d say hes definitely the Brewers best hitter. SHANE VICTORINO: The Flyin Hawaiian has been one of the bright spots for the Phils this year. We all wanted to believe he could replace Aaron Rowand, but we were not quite sure. He certainly showed hes an everyday starting CF, hitting .311 with a .498 slugging percentage after the All-star break. 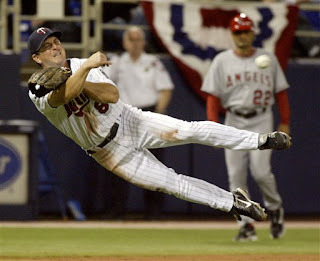 Also, the man can absolutely fly and will chase down anything in centerfield and is always a threat to steal bases. MIKE CAMERON: Cameron has more power than Victorino with his 25 homers this year, but his .243 avg and .331 OBP are no where near as good. JAYSON WERTH: He has been a huge part of the Phillies run this season. Always plays hard, is a threat to steal bases and has a better arm than Geoff Jenkins. Hit .313 with 6 homers and a .600+ slugging percentage in August when some of the other Phillies bats were struggling. COREY HART: Got the most AB’s on the brewers team this year. Doesn’t get on base as much as Werth, will try to steal some bases although not as well as Werth’s 20/1 ratio. Hart has similiar HR and RBI numbers as Werth. PHILLIES: Led by Cole Hamels who will make the Game 1 start. Hamels had the third highest inning total in the majors behind only Halladay and Santana. He had a solid 196/53 K/BB ratio on the season. Hamels posted a 3.09 ERA on the season, while only getting 14 wins mainly as a result of bad luck and giving up 29 home runs on the season. Jamie Moyer led the Phils in wins with 16 and posted a 3.71 ERA. Somehow the Old Man manages to get it done. Who knows what Brett Myers will give you. After being sent down, he did throw solidly after the all-star going 7-4 with 3.06 ERA and a 75/21 BB/K ratio. The biggest difference: He only allowed 5 home runs after the break(24 before). Blanton should round out the starting four, and you just hope for six innings and less than four runs from him. BREWERS: CC was probably the best pitcher in the NL this year. He threw on three days rest seemingly all of September and will probably do so again in Game 2 of this series. 1.65 ERA since coming to the Brew Crew with 114 Ks to only 19 BBs. Ben Sheets has pitched more this season than he has in awhile. 198 innings is his highest total since 2004. And it took a toll too as he is out for the series. He was only 3-6 with a 3.46 ERA in the second half of the season. Jeff Suppan, Yovani Gallardo and Dave Bush should be the other three pitchers for the Brewers, and they aren’t scaring anyone. PHILLIES: Phillies bullpen has been and undoubted strength for the team this year. Lidge is 41/41 in save opps throughout the season. Durbin, Madson and Romero have largely been solid for the team, although they all may be showing signs of tiring. Heck, even Rudy Seanez and Scott Eyre have made big outs for this team. There is a possibility that Happ and Kendrick will be in the pen to help out. BREWERS: The Brewers bullpen is bad. Not Quite Mets bad, but the Phillies will have a real chance for a few comeback wins in this series. PREDICTION: without knowing the Matchups other than King Cole is starting game one, I’ll say Phils in 4. We should have a live blog running on Wednesday. See you then. The White Sox are in a tough spot. After getting swept by the Twins, then losing a few games to the Indians in the final week, they are looking at a collapse similar to that of the awful Mets. The White Sox once had a lock on the central division. Now they have to win two games in a row just to get to the playoffs. The White Sox and Tigers are the only teams who’s regular season is not yet over. The White Sox trail the Twins by a half game in the AL Central. They need to win this game just to force a one game playoff. The Tigers are a team that has underperformed all year. There were such high expectations for this team, but their pitching was not there and their hitting was not strong enough this season to make up for it. 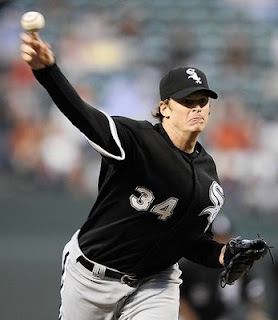 The White Sox are sending Gavin Floyd to the hill, who is 16-8 with a 3.91 ERA. He is however, pitching on short rest. Since Floyd isn’t spelled “S-a-b-a-t-h-i-a” this could potentially spell out trouble. The Tigers are capable at anytime of pounding the ball. We should know early on whether Gavin Floyd has enough to get the job done or not. The Tigers will be throwing Freddy Garcia who has only pitched 10 innings this year and is 1-1 with an ERA over 4. While this game obviously means nothing for the Tigers, I think Garcia is looking to play the spoiler tonight. After suffering a shoulder injury in 07, and not pitching much/well in ’08, look for Garcia to go out with a sense of purpose. I think Gavin Floyd will pitch a solid baseball game. Something along the lines of 5 innings 3 earned, a performance that will keep them in the game. I don’t really think Garcia is going to have much to offer today. Look for him to come out with a lot of intensity and the mind set of being the spoiler, but the Chicago bats are going to be too much for him. I just really want to see a one game playoff, so thats where my head is at.